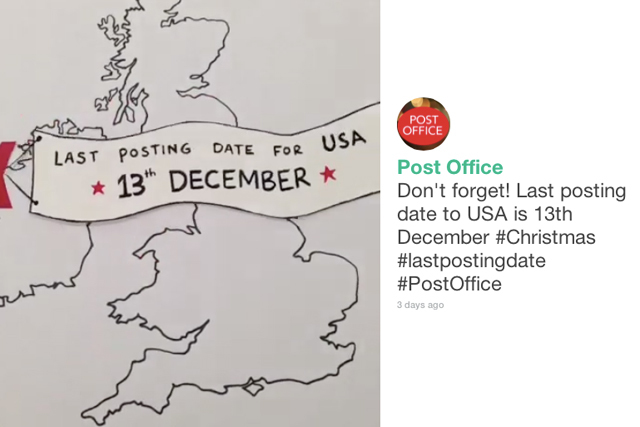 The Post Office has turned to Twitter video platform Vine to remind people of the last posting dates before Christmas and to offer gift wrapping tips for presents being sent to loved ones. The campaign, created by Mindshare, continues the brand's "handled with care" core message in a humorous way. The Vines use stop motion and hand drawn illustrations. The series of six-second clips form a key part of the Post Office's social media strategy and can be viewed at the brand's Twitter page – twitter.com/PostOffice. The Vines will also appear on Facebook, LinkedIn and Google+, supported by promoted tweets. Darren Jones, social media manager at the Post Office, said: "The Vine videos are a creative way for us to break through the noise on social media, and communicate key messages to our customers, using this innovative and growing channel." In October, the Post Office appointed Martin George, Bupa's former top marketer, to the position of chief marketing and commercial officer, overseeing the leading of marketing, mails, telecoms, government and digital teams. The Post Office is unaffected by the flotation of Royal Mail as it now operates as a separate company.